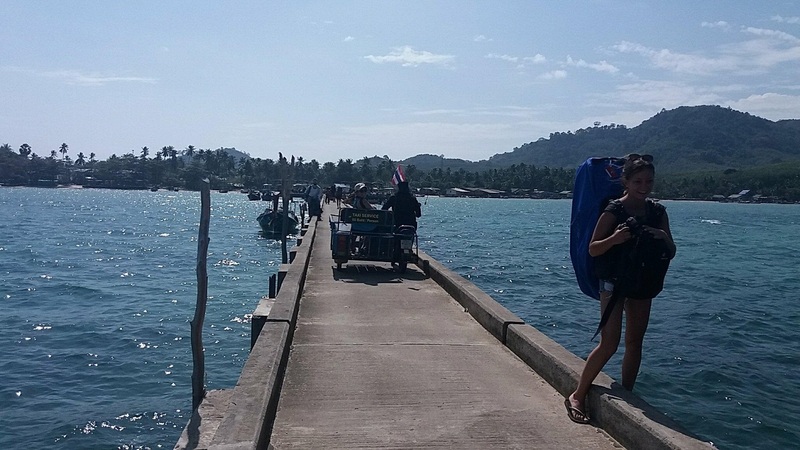 The island hopping in Thailand is well organised! Leaving Koh Lanta with a small hangover! 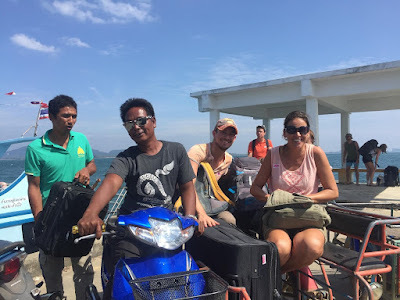 After spending one week on Koh Lanta, which you can read more about in this article, I was ready to hop on to the island of Koh Mook, also called Koh Muk. Somehow I always feel it when I had drinks the night before, even if I had only 2 beers! Maybe because we´re getting older or because I don´t drink so often anymore, because in the past I could handle this much better. 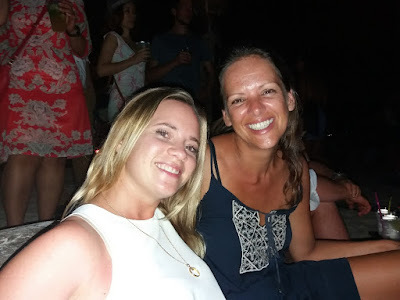 Now, on my last day on Koh Lanta I was having a few cocktails with my friends from the Netherlands, so I had a small hangover! Two beers is one thing, but 3 cocktails made me not wanting to get up and feeling super tired all day! On the boat from Koh Lanta to Koh Mook I met two other single travellers: a girl from the United States and a guy from Germany. It´s funny how sometimes you meet people and have a good click from the beginning! We were all about the same age (30 plus at least) wondering if we´re not too old for backpacking and happy to find some similar-aged company. Upon arriving it appeared that the German guy (Sebastian) was also staying in the same accommodation as me. Our taxi driver, Toni, was waiting with his tuk-tuk to bring us to the Koh Mook Garden Beach Resort, or better said ´Dada´s place´. I got a very small beach hut, which looked very cosy with a bright pink mosquito net, a mattress on the floor and an open bathroom, it felt almost like camping! 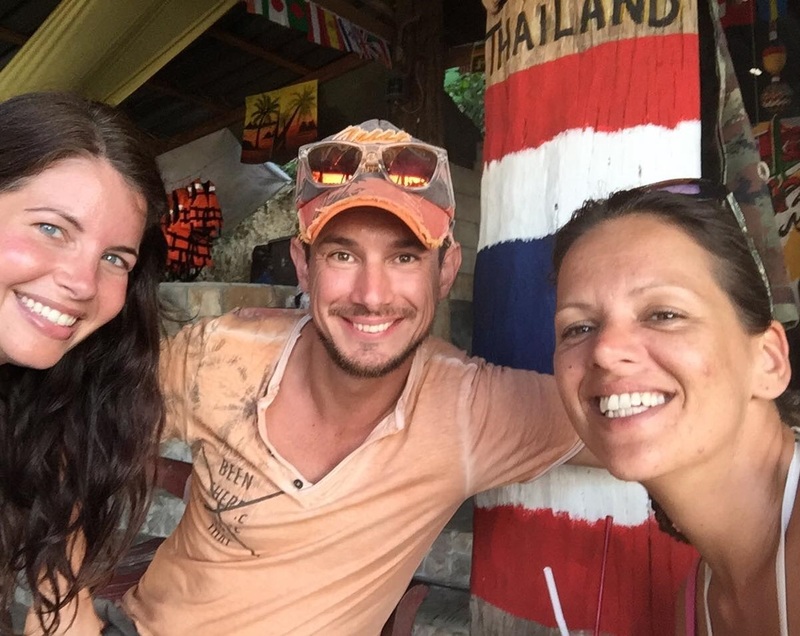 Three single travellers on Koh Mook! Cocktails again on my hangover day!! We decided to catch up with Reneé, the girl from US, who was staying in another accommodation and so we went to Charlies Beach. 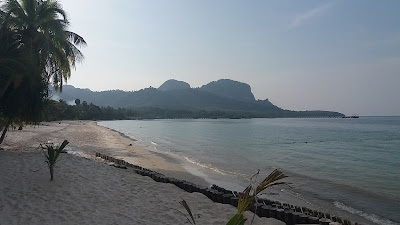 Koh Muk is very untouched and there were only a few other travellers on the beach. We first enjoyed a swim and then headed down to one of the few bars, Mong Bar, right at the beach. We started to drink cocktails again! Honestly, I couldn´t believe myself. I didn´t drink for almost a month, other than the day before and I could still feel these cocktails and now I just decided to go on and again with cocktails! But it was good fun though! The sunset was amazing and the most interesting thing was that we barely knew each other and had such a deep conversations about purpose, doing what you feel inside, our function in live, spirituality and even religion and politics! What a couple of cocktails can do sometimes! Cocktails again on my hangover day! I have written a full article including practical travel information about Koh Mook, because I think this island is amazing and my favourite one so far! It´s well worth an article on its own. In the night time the weather got really stormy and rainy. Being in my little camping hut, I felt like being on a ´Cast Away´ island. The jungle noises, the stormy beach, it was amazing! 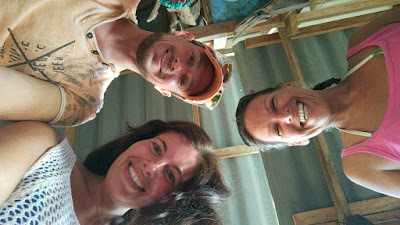 While carefully tucking in my mosquito net all under my mattress edges, I needed to push the thoughts away of ´What if a snake decided to come into my hut?´ But it was all part of the amazing overall adventure experience. The next day I woke up with the sunshine again like there was never bad weather at all. A good day for a visit to the Emerald Cave! The Emerald Cave is the main attraction of Koh Mook. It got it´s name due to the emerald green-blue colour which you see when you´re inside the cave. You can go there by boat and than swim inside or you can kayak. We rented a triple cayak and left from Charlies Beach. If I remember it right we kayaked about 20-30 minutes before we arrived at the entrance. But now we were a bit lost. “Can we just go in and see!?”. Fortunately, we met two other tourists on a kayak just coming out. They told us that the tide will still be OK for another hour orso, but that we need a light since it´s pitch dark inside. So, did we realise here we weren´t prepared at all!? We didn´t know about the tides but it makes sense for a sea cave and we didn´t have a torch and also didn´t want to risk our mobile phones from falling in the sea. 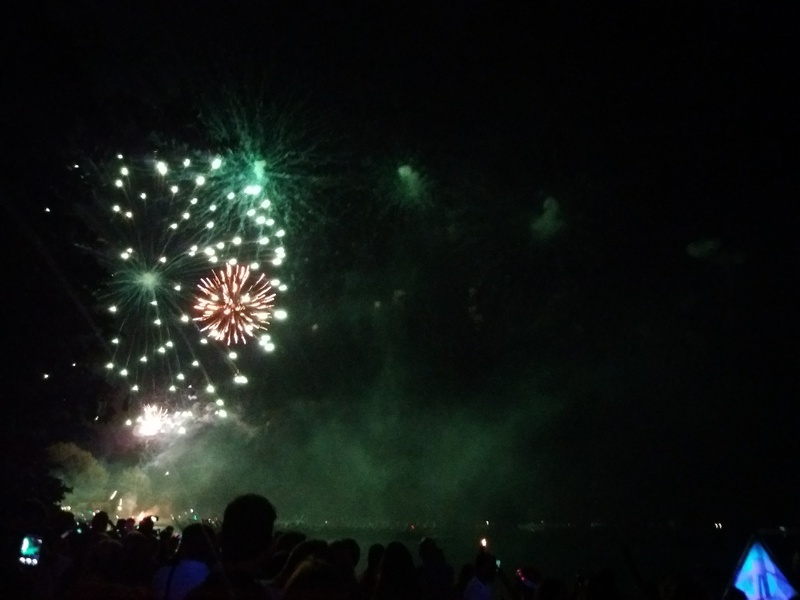 At that time another kayak arrived, from which the people did have a torch and we could follow them and they lighted us the way. Once we arrived at the other side of the cave, a amazing secret beach was waiting for us, completely surrounded by high cliffs and amazing jungle sounds echoing through. This was another movie moment. I just loved it! The remaining days existed of walking around the island, have more dinners, good conversations and one more cocktail night. I was really sad when both Reneé and Sebastian left the island, we had so much fun with the three of us. But then I met a Dutch couple with the woman having her roots in the super tiny village in the Netherlands, where I´m from! What a small world after all! Their son was setting up his own accommodation and so they already came here for several years. Nice to hear my own Dutch dialect! 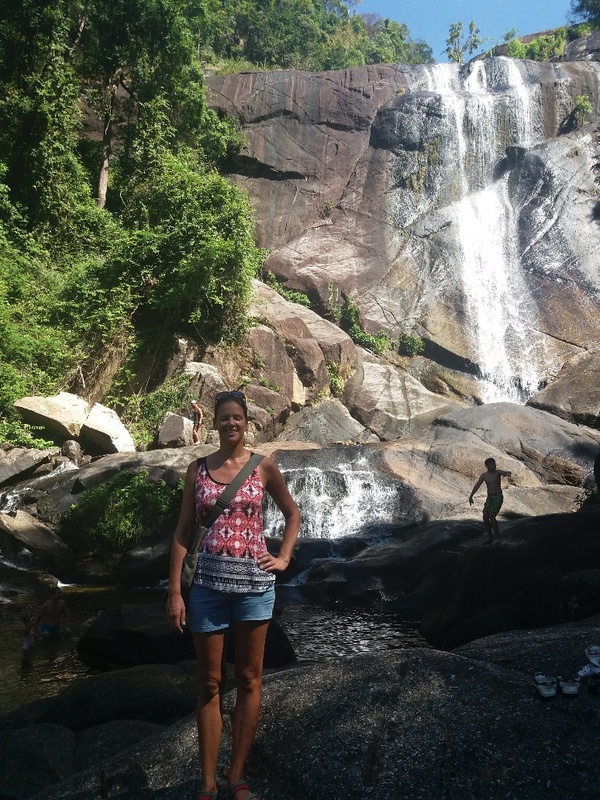 Other things you can do on Koh Mook include jungle hikes, one to a viewpoint and one to a secret beach and there´s a dive center too. You can click here to read my complete article about this little paradise ´Cast Away´- island including all things to do, hiking routes and practical information. I completely fell in love with Koh Mook! But for this article, my island hopping continues! By the time it the last days of the year arrived, I arrived at the island of Koh Lipe, also called Ko Lipe. First I was a bit overwhelmed by the amount of tourists on such a small island, especially after Koh Mook where, in contradiction, the nature outbalanced humanity. 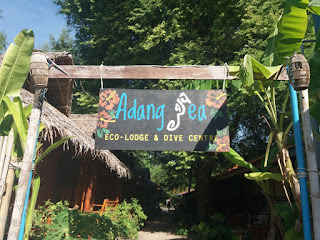 But I booked my stay in the eco lodge of Adang Sea Divers and I totally love their concept! 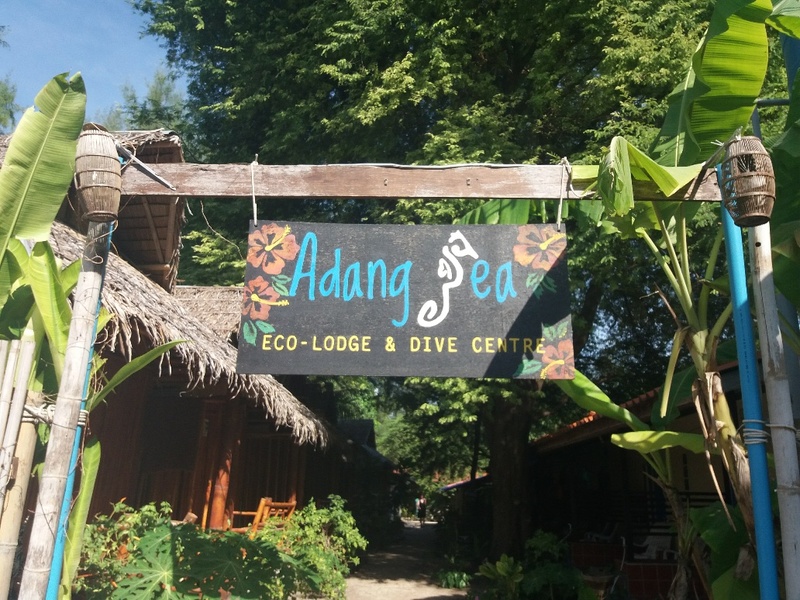 They provide their guests with a stainless steel water bottle which can be refilled for free to prevent too much plastic garbage on the island, they do weekly beach clean ups and are very conscious about the environment. For the accommodation all shower and toilet water gets filtered and bacteria are getting eliminated and the water is used to water plants before it returns to the ground water. I straight booked in some scuba diving for the next day. Even though it must have been one of the busiest days of the year for them, the diving was very well organised. Everything took place in small groups and I was only with another couple and one dive guide on a long tail boat. However, the weather conditions weren´t the best, so we couldn´t go to the greater dive spots but instead we did a dive on the dive spot called ´Pattaya Corner´, located just of Pattaya Beach. It was the last day of the year and probably the upcoming full super moon on the 1st of January was having her effect on the oceans. 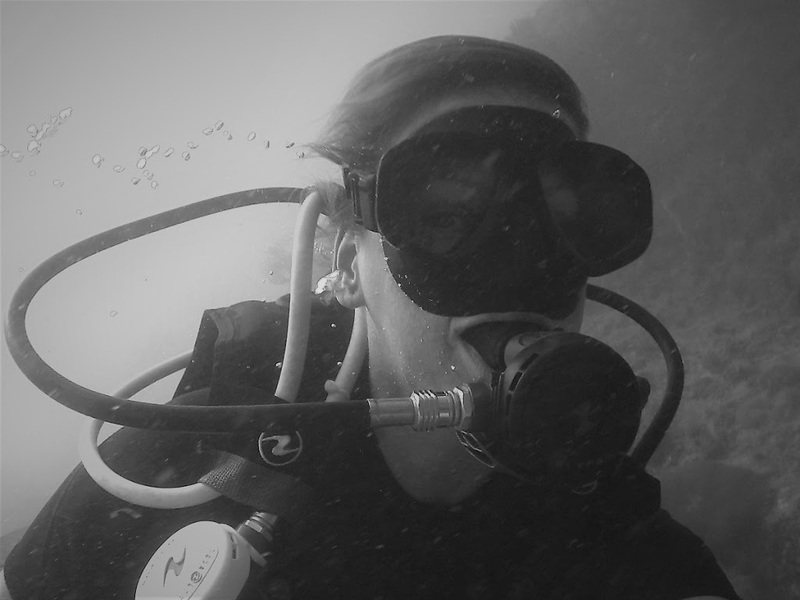 Nevertheless, it was fun and I especially loved the pink-purple coloured soft corals, the dive site was full of them! Surprisingly, the water was a bit colder here! 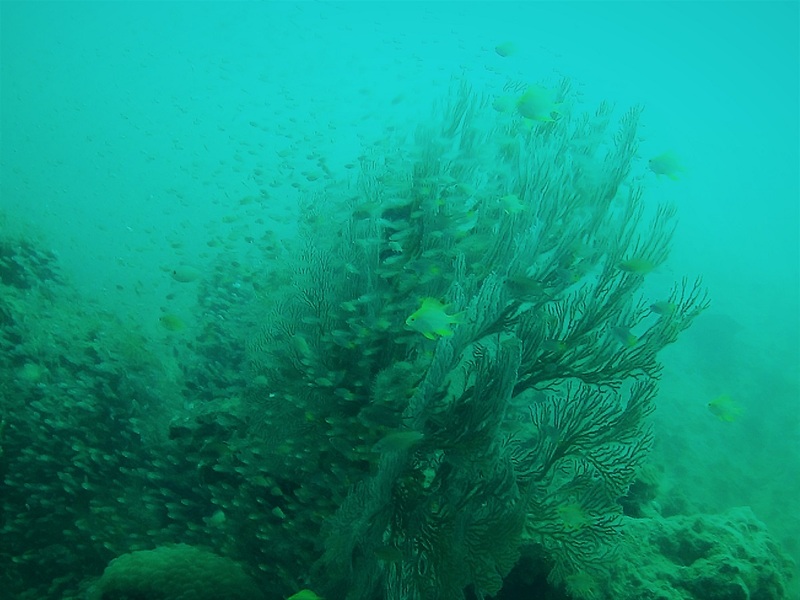 My dive computer showed ´only´ 28 degrees Celsius, which is 2 degrees colder than Phuket and Koh Lanta, which is probably why the corals look so good and the water is less affected by ´El Niño´ and global warming. You can read the full article here. 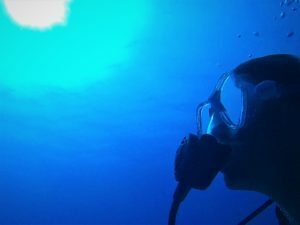 My last dive of 2017! It was new years eve today and I expected to meet some fellow divers to celebrate this special night with, but I didn´t. So, to be honest, I was a bit disappointed. I was thinking: ”Am I really going to be by myself with new years evening?” and I was also telling myself that´s it´s just another evening with a label we hang onto it, I might as well do some writing. But around 9 PM I changed my mind and decided to have a drink by myself anyway. So I went down to the bars at the beach and after a walk around I sat down at a bar with cushions on the floor and some nice music. I looked around me and saw a girl sitting by herself to the right, behind me and a guy sitting by himself, right behind me. At the moment I look around I saw the guy heading over the girl and they invited me to come over as well. 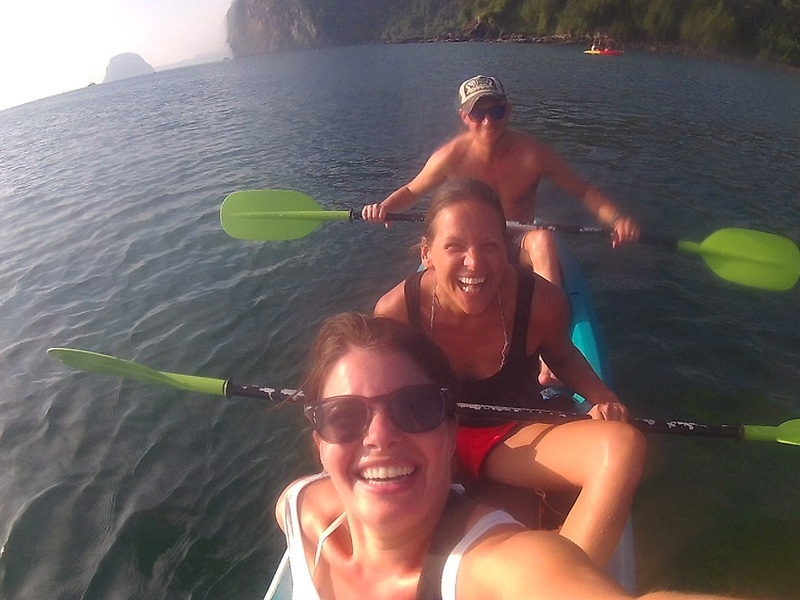 Apparently, we were all 3 single travellers, exactly like on Koh Mook. So I introduced myself to Swedish Jo and Australian Joe and we decided to have a good night together. And oh boy we did! I was dancing bare feet on the beach till about 4 am, even on my favourite Latin music when the bar staff let me also be the DJ. I could not have had a better start of this new year! Thank you! From Ko Lipe I continued my trip to Langkawi Island in Malaysia. I first arrived in Kuah which I didn´t enjoy that much, maybe because I´m not so much a city person. Many people come here for the tax free shopping but I´m not a big shopper either and on top of that my backpack is pretty full since I´m travelling with a smaller backpack. But even as a city I don´t think there was much to see, other than the Eagle Square. Although the island of Langkawi offers many things to do including waterfalls, caves, stunning beaches, amazing forests and is stated by Unesco as Global Geopark with 3 Geoforest Parks. Landscapes exists of rock formations, lime stones, sea arches, caves and fossils from which are over 480 million years old. I don´t even get that number of years concrete in my mind to be honest! I did enjoy myself by doing working on writing jobs for an extra income in Kuah before I continued to Pantai Cenang. But in Pantai Cenang I mainly relaxed. Yes, I ´m also getting a bit lazy during this trip. 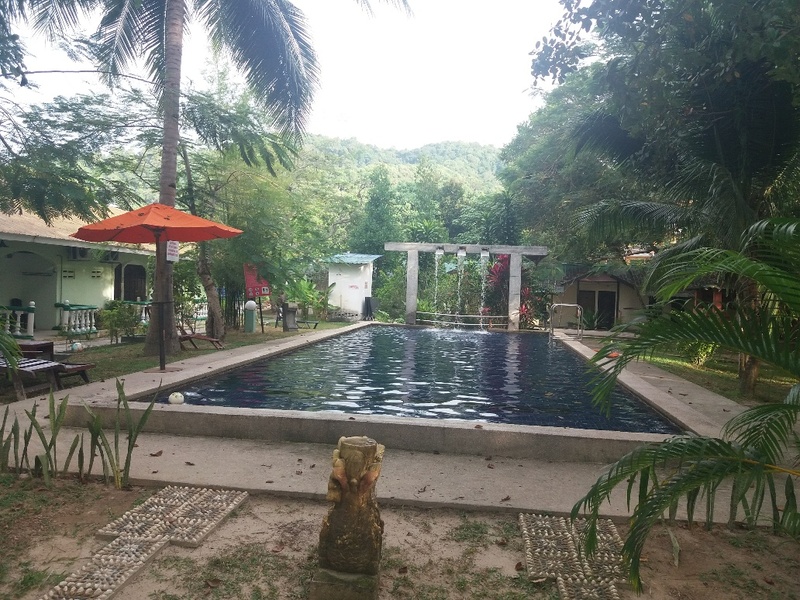 I booked again an eco accommodation, Green Village, but surprisingly they had a swimming pool. What a luxury for me, so I got the most out of it. I also went to Langkawi Underwater world! Although I usually don´t like to support these attractions since I believe we should leave animals in their natural behaviour, I also saw some good things in this one. They really make people aware, educate children and it might serve to help getting more respect to the underwater life in the future. I don´t know but I went anyway and learned a lot, especially about the octopus! I decided not to go for diving since I only heard and red that the water could be quiet murky and that Koh Lipe was considered much better diving. Instead, I booked a snorkelling trip. And here yet another one of my typical Ellis bloopers: I missed the trip because I arrived one hour too late, due to the time difference between Malaysia and Thailand which I figured out on my 4th day on Langkawi! And first I almost started a discussion and told the people I´m 15 minutes, early. Till I realised.. Really……! I enjoyed the swimming pool in my eco accommodation! 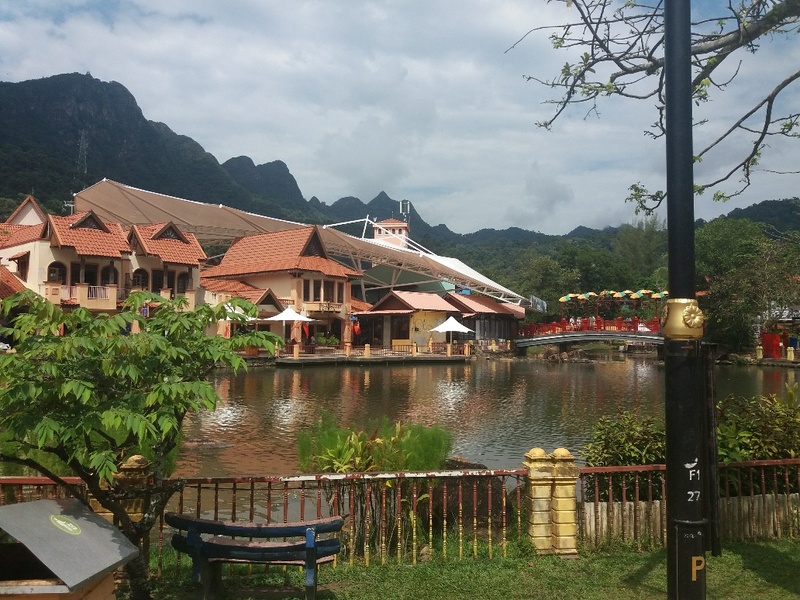 Another blooper was that I thought I booked a nice and quiet stay in the nature (since it said it´s located in the Geopark Forest) which ended up being in some kind of attraction park, called Oriental Village! And I booked a bit longer beforehand, since I planned to do some writing, LOL! Although the evenings were quiet, they were actually too quiet since everything, including the restaurants, closed around 06.00 pm but I had some good quiet nights. I also really loved this hotel, called Geopark Hotel.I paid less then 15€ a night for a super clean room, airco, hot water and very friendly staff. I can recommend to stay there if you like to go the Oriental Village anyway and like to see some other things in this area of Pantai Kok. Again I did some work for the writing jobs and finally got to watch that movie ´Wild´. This movie was recommended to me by a couple of friends since a long time now. I totally loved it! So recognisable to escape ourselves after a big loss in order not to feel our pain. In this movie the girls looses her mum, in my case my mum and dad, but I had some escaping behaviour after my losses and this all comes back in my book later on. Although I never did a hike like the girl in the movie does, I´ve also been in situations where there was just no way back and where I needed to push my limits. Being in situations in life where nothing turned out the way I planned, but needed to go on in order to make dreams come true or save a flight ticket to Europe, during my time as a diving instructor or other jobs around the world. Shortly, everything in this movie was recognisable. I can highly recommend it!! 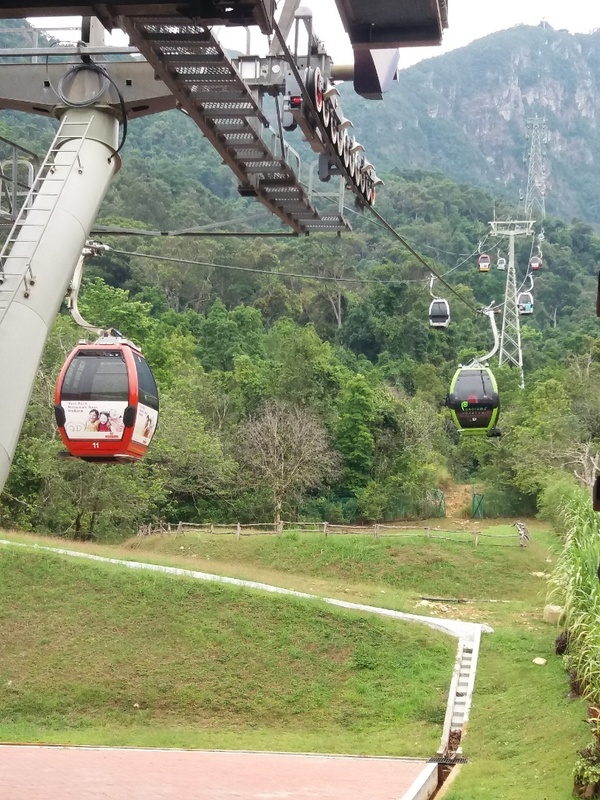 I also enjoyed myself in the ´attraction park´, I went in the Cable Car, called ´Skycab´, which brings you to the top of the ´Gunung Mat Chincang´ and offers a nice view over the Machinchang Cambrian Geoforest Park. I have to agree I didn´t feel completely comfortable being in a tiny cabin with all glass windows and on top of that there was French couple in my cabin with a little one who was just jumping around, making us swing a bit. They say it´s the longest free span single rope cable car with her 950 metres and even made the Malaysian book of records. It´s the steepest cable car in the world with a gradient of 42 degrees! Also I really enjoyed the 3D- arts museum a lot! 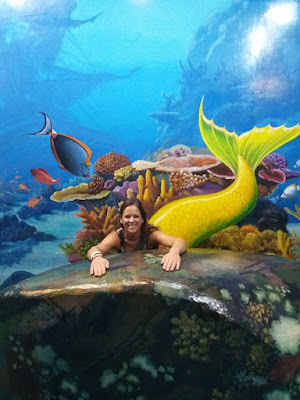 But at some point I was a bit sick of asking people to take pictures of me, so I stopped doing that after I passed the underwater world LOL!! In the area I also explored the 7 well waterfall which was a pretty good climb! 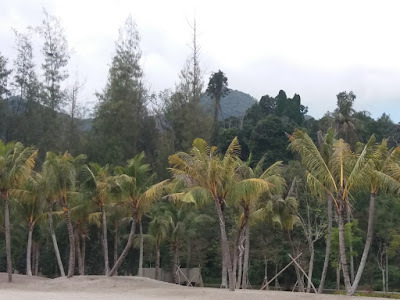 And I enjoyed walking along the, nearly empty beaches in the area and did a visit to the Telaga Harbour. From there I took the ferry back to Thailand, ready to get a new visa-stamp! ´Splashpacker´, I enjoyed the 3D arts museum!! Shortly, I had a good time on Langkawi and I really love the island. But it´s not a great place to meet a lot of other single travellers, so if you´re a single traveller and not able to entertain yourself much (unless you like shopping!) I think it´s better to stay in Thailand. For couples or families I think Langkawi Island is great especially if you like nature with some adventure. However, this is just my opinion. Stay tuned for my next article in which I take you to the very untouched (even more than Koh Mook!) island of Koh Bulon Le before I hop on to Koh Libong where I met a fantastic inspiring Spanish family and some other nice people. I went to an amazing cave and viewpoint with another traveller, Martin, I met there. Then on the island of Koh Jum (also called Ko Pu) I had the best food ever, funny how this fits with the name of the island, it was JUMMY! For other articles like these, you can click here for an overview of all my travel blog updates. And if you´re interested in all articles about hopping the islands of the Andaman Sea, then click here. Scroll down to the pink part for my mailinglist.